Architects are the creators of wonderful structures and buildings. If you pursue your career in the architecture field, you have a number of career opportunities relying upon your specialization or expertise for example Elevation Designer, Landscape Designer, Interior Designer, Building Designer, and Urban Designer. RV college of Architecture, Bangalore provide B.Arch course. The focus of direct admission in RV College of Architecture, Bangalore is to integrate technology, science, and art for the growth of youth’s attitude in the field of architecture. The Rashtreeya Sikshana Samithi Trust was established by M.C. Shivananda Sarma in 1940. It is basically a charitable trust. RSST run various educational institutions. These institutions can range from KG schools to certified institutes in Bangalore. You will find 250+ trustees in this charitable foundation. After every 3 years, they elect a board consisting of 28 members. The function of this elected board is to oversee the various institutions and the different activities performed by the trust. The Students graduated from these institutions in the last 7 years have exceeded expectations in life, bringing glory and laurels. RV College of Architecture is situated in Banashankari in South Bangalore. The college is surrounded by 2.4 acres of land. The college is approved by VTU (Visvesvaraya Technological University) and in 2014 government of VTU, Belagavi and Karnataka approved this as standalone institutions. The campus has 15000 sq. m floor area which comprises of the hostel, administrative block, and academic block. 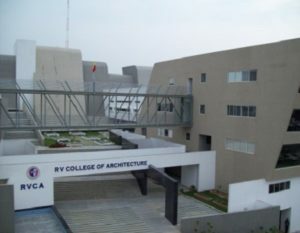 RV College of Architecture was established in 1992. The RV College of Architecture students won Architectural thesis NIASA awards in 2011, 2009, 2008, 2007 and 2006. Today, RV College of Architecture Bangalore runs two courses: B.Arch, and M.Arch (UD). Why Take Direct Admission in RV College of Architecture, Bangalore? Studios: In RV institution, you will find 12 spacious and well-designed studios which are furnished with 40 workstations. Lecture Halls: There are 10 lecture halls with 40 to 80 student capacity. Theses lecture halls possess modern teaching tools to facilitate an interactive and effective learning environment for students. Library: At RV College of Architecture, Bangalore, the library has 5000 volumes and 4000 titles. The library also has the access to 10 international and 20 national journals. Computer Lab: The RVCA computer labs are equipped with the latest software. There are 60 standalone computers of latest configuration with licensed software. These are Revit, Autocad and much more. Construction Yard: It is located outside. Students can design their hands-on different activity to assemble components of various buildings like domes, piers, arches, walls, et cetera. Sports Facility: Indoor and outdoor sports facilities are provided by RVCA College which includes a gymnasium, badminton court, table tennis, carom board, chess etc. Hostel: A Separate hostel for girls and boys are available. There are 43-bed rooms in the Girls’ Hostel. At Venkatadri Hostel there are 30 bed-capacities which are situated at a distance of 4 km from the campus. 4 meals are provided in a day in a vegetarian mess. If you find that the above-mentioned facilities are as per your demanding needs then, you can take direct admission in RV College of Architecture, Bangalore. We will guide you.